Artist Susan Bradshaw considers glass to be a magical material—and we certainly agree. 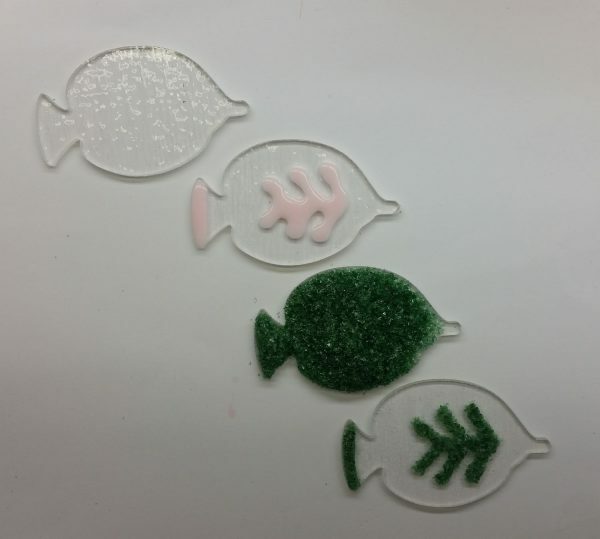 We fell in love with the vibrant colors and playful, aquatic themes of her fused glass creations, selecting several of them for our 2018 ornament collection. Susan graciously offered us a glimpse of her creative process, explaining how the magic happens in her Washington-based Woven Time Studio. 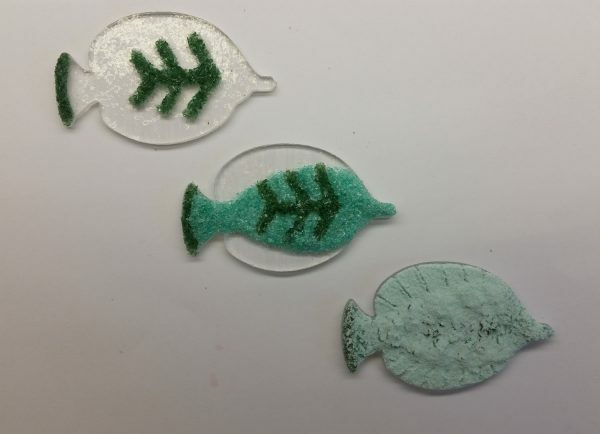 To create the fish in her “School’s Out” series, Susan begins by embellishing the blank shapes with colored powder and frit (crushed glass). She first draws lines onto the glass with glue. Next, she spoons dark green frit onto the glue and dusts off the excess, leaving color only where she wants it. 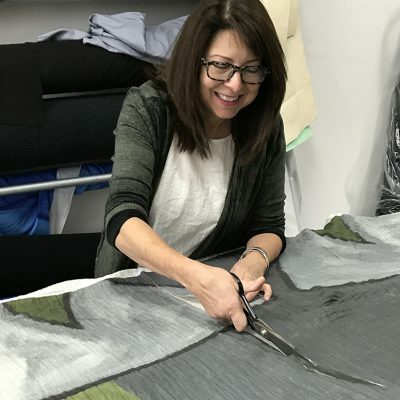 After allowing the glue to dry, Susan spoons lighter green frit onto the fish’s body and tail. This time, she doesn’t use glue. 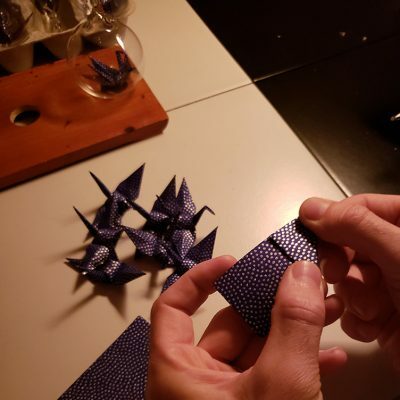 The frit fills in the spaces around the initial design, and any that lands on the fins gets brushed off. 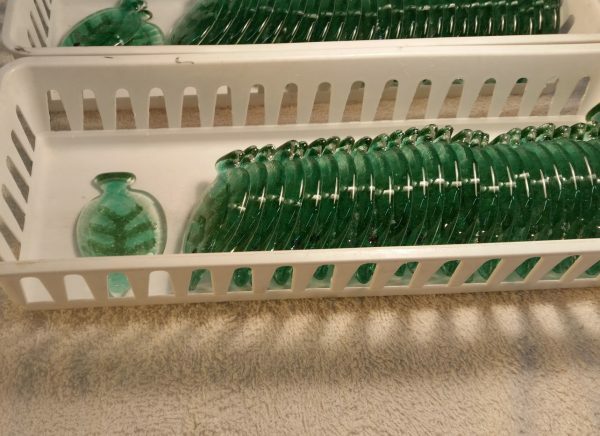 Finally, she sifts a fine, powdered green glass over the entire piece—and then it’s ready to be fired! The tiny fish are arranged on a kiln shelf, and then they’re placed into the kiln to be fused. 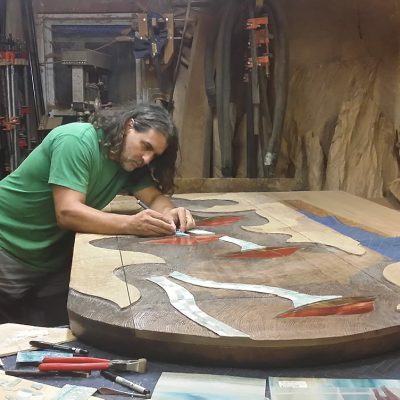 In the kiln, the pieces are heated to about 1400 degrees Fahrenheit, which melts the glass enough so that the fine grains of frit and powder fuse together into one single, beautiful work of art. 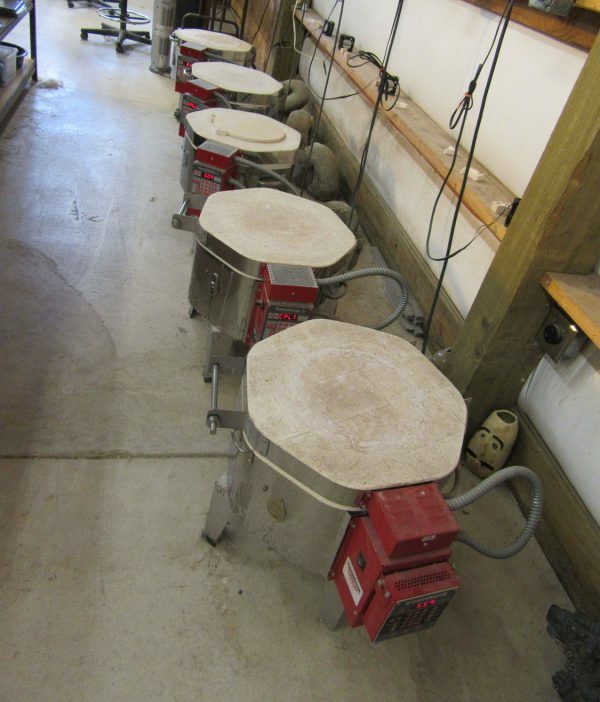 Finally, they’re out of the kiln and ready for your tree! 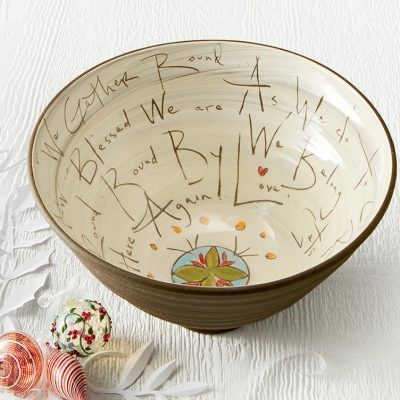 At all steps of the process, Bradshaw finds visual beauty. “Here the play of light and shadows catches my eye,” she explains. 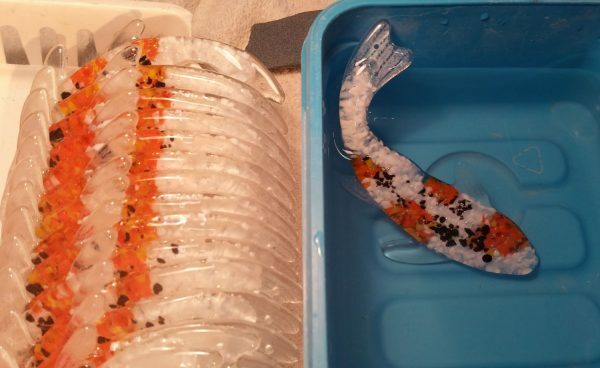 Each Koi ornament goes through similar steps of embellishing with frit and powders, then firing to 1400 degrees. 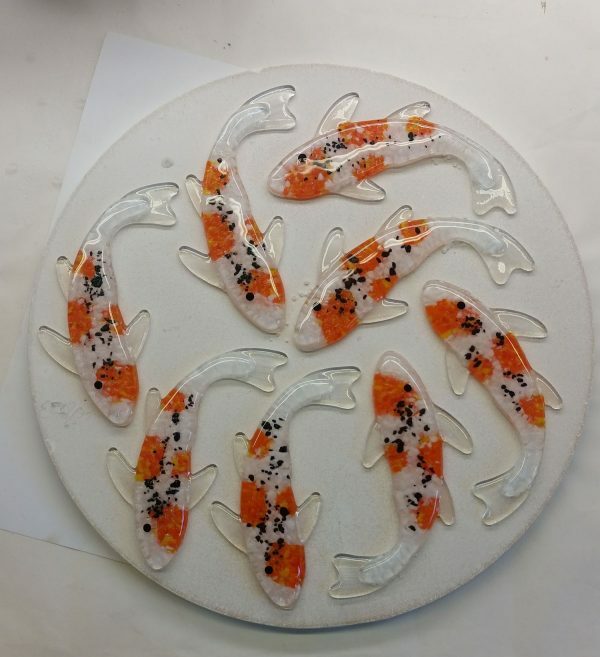 Here, a school of koi are fresh from the kiln. After coming out of the kiln, the artist drills a hole for the hanging loop and gently polishes the bottom edges to remove any burrs that might have formed in firing. Finally, the piece undergoes a water rinse before the wire loops are attached—which also reveals the enhanced color and contrast of the glass when placed underwater. 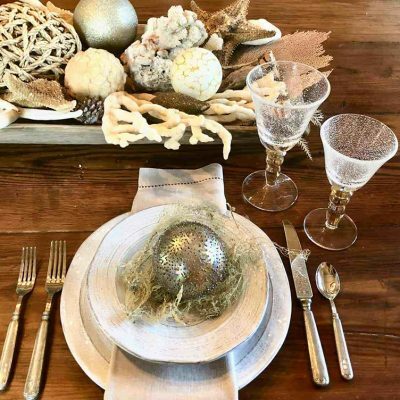 Interested in adding some of Susan Bradshaw’s magic to your holidays? Shop her work and explore our full ornament collection.